Randall Park is located in the McCowan/14th Ave area. If travelling north on McCowan from Steeles, turn left (west) on Denison and turn right (North) on Townley Ave. Randall Ave is the first left - there is a school parking lot located on the side of the field. Father Michael McGivney is located at the North east corner of McCowan and 14th Avenue. If driving North on McCowan, you would pass Steeles, Denison and Highglen Avenue. The next intersection is 14th Avenue and you can't miss the school on the right hand side. Elson Park is located just North of Elson Street and Coxworth Avenue. From McCowan and Steeles, travel North until you reach Elson Street (first street on your right). Turn right on Elson Street and keep travelling East past Middlefield Road. You will be getting close to Coxworth Avenue when you pass Ivan Daniels Drive and Irenemount Crescent. Coxworth Avenue will be the next street. Turn left and travel North on Coxworth Avenue until you see Parkland Secondary School on your left hand side. You can park in the school lot and the field is at the back of the school. If travelling from McCowan and Hwy. 7, travel South on McCowan Avenue past 14th Avenue and Highglen Avenue. When you reach Denison Street, turn left and keep travelling East on Denison pass Middlefield Road until you reach Coxworth Avenue. Turn right on Coxworth Avenue and keep travelling South until you reach Parkland Secondary School which will be on your right hand side. You can park in the school lot and proceed to the back of the school to the soccer field. The major intersection closest to Mintleaf Park is 9thLine and Hwy 7. From 9th, Line and Hwy 7, keep travelling North on 9th Line. Turn left at Fincham Ave which will be on your left hand side. Keep travelling West on Fincham past Larkin Ave. The entrance to the field will be the next right after Larkin Ave. Note that there is also a baseball diamond adjacent to the soccer field. Armstrong Park is in between Main St / Markham Road and Ninth Line. It is also North of the 407 but South of Hwy 7. The park is located behind William Armstrong Public School (11 Major Button's Dr, Markham, Ont.). If travelling East on Hwy 7, pass Main Street/Markham Road until you reach Wooten Way. Turn Right on Wooten way until you reach Major Buttons Drive (on your right hand side). Turn right on Major Buttons Drive and you will see William Armstrong Public School on your left hand side. Turn into the parking lot and proceed to the back of the school. 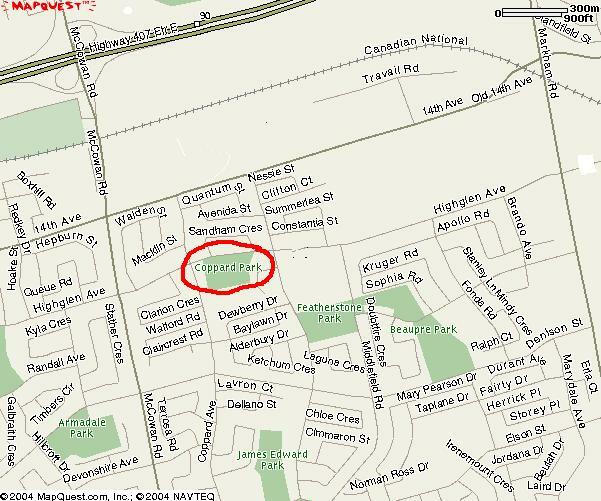 Coppard Park is located just east of McCowan off of Highglen Avenue. Note that Highglen Avenue is one street south of 14th Avenue. From McCowan and Steeles, travel North pass Denison Street. After Denison, the next street is Highglen Ave. Make a right on Highglen Ave. and pass the second stop sign. You should see the park on your right hand side. The field is at the bottom of a small decline. If you go to Middlefield Avenue, you have travelled too far East. Middlefield C.I. 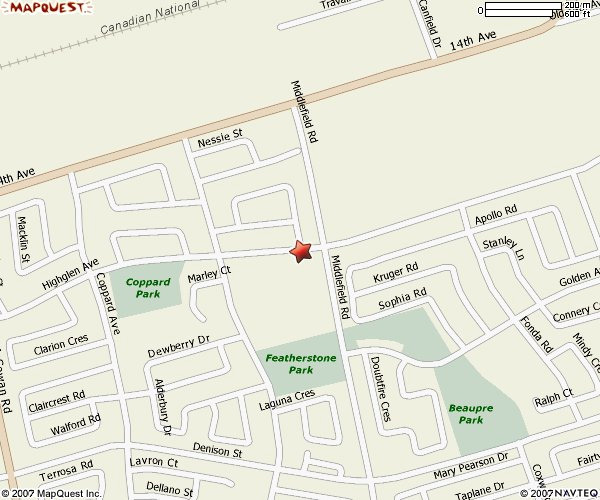 is adjacent to Coppard Park which is located just East of McCowan off of Highglen Avenue. Note that Highglen Avenue is one street south of 14th Avenue. From McCowan and Steeles, travel North pass Denison Street. After Denison, the next street is Highglen Ave. Make a right on Highglen Ave. and pass the second stop sign. You will pass Coppard Park and right before you approach Middlefield Road you will see Middlefield Collegiate Institute on your right hand side. Pull into the parking lot and the field is straight ahead. If you pass Middlefield Road, you have travelled too far East. 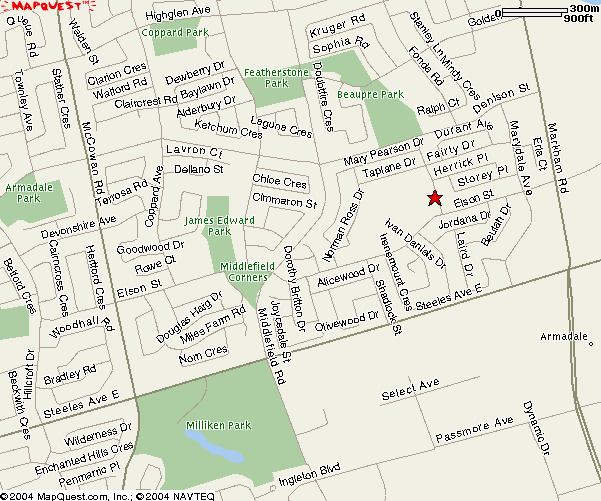 Raybeck park is located behind Raymer Wood Public School (11 Cairns Dr, Markham, Ont.) The park is located just North of McCowan and Hwy 7. From the latter intersection, travel North on McCowan, pass Bullock Drive until you reach Raymerville Drive (which will be on your Right Hand Side). Turn Right on Raymerville Drive and keep travelling East until you reach Cairns Drive which will be the first street on your left hand side. Turn left onto Cairns Drive and then turn right into the parking lot. The field is located behind the school. The field is located off of Fenton Rd. which is located in between Brimley and Midland just North of Steeles. From Brimley and Steeles, travel West on Steeles until you reach Fenton Rd. Turn Right on Fenton Rd and the entrance to the field is straight ahead. Fields located in L'Amoreaux Park side by side by the bleachers. If coming from the 401, exit at Warden and travel north to Sheppard. Turn right and continue on Sheppard to Birchmount Rd. Turn left and travel North on Birchmount until you reach Silver Springs Blvd. Turn right on Silver Springs Blvd and you will see the entrance to the park on the left hand side. The field is located in between Lawrence and Eglinton off of Pharmacy Ave. The field is on the East side of Pharmcy Ave and there is an extra parking lot off Singleton Rd.